The AR Hatteras Norther Lights Bluetooth® wireless Speaker is part of our Elite Series and it truly is elite. This speaker won the Innovations Award at the 2015 Consumer Electronics Show in Las Vegas. With two 20-watt amplifiers, it delivers 40 watts of true stereo 4-way sound in a single 2-foot tall tower system. A large, built-in passive subwoofer provides superior bass clarity. Home theater-quality sound is now available outdoors. Bluetooth® connectivity offers you the freedom to control and play music wirelessly from your smartphone or tablet and the Aux-input gives you the option of a direct connection. Not only is it well designed, it's weather-resistant and perfect for any season. 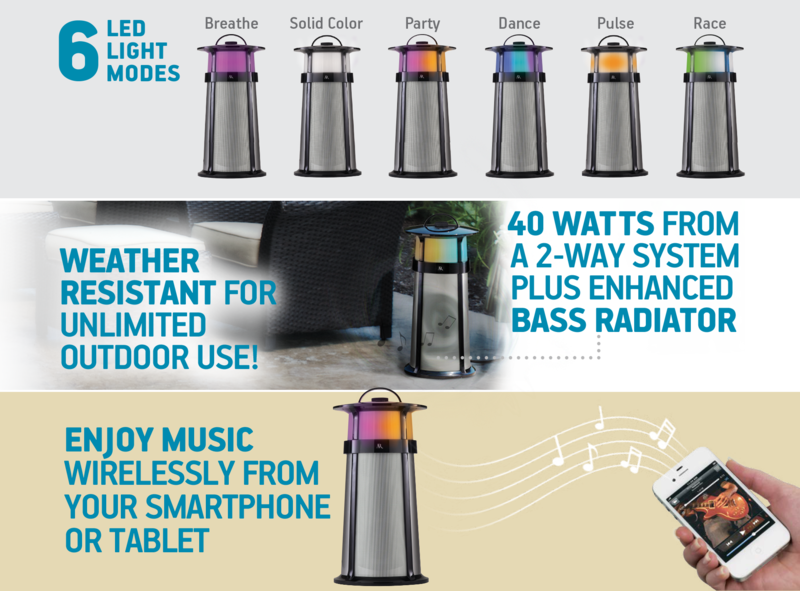 The Hatteras also provides 6 modes of 360-degrees of 6 LED light modes (Breathe, Pulse, Solid Color, Party, Race and Dance) with multiple settings - music pulse, solid high and solid low, so you can light up the night on your patio or deck. Now there's no reason your party should stop when the sun goes down. GREAT SOUND. EASY TO MOVE ALL OVER THE HOUSE UNTIL MY WIFE DEMANDED THAT IT STAY IN THE KITCHEN. THE SOUND GOES FAR BEYOND THOSE LITTLE BLUETOOTH SPEAKER THAT EKES OUT A THIN WEEDY SOUND. FOR A PROPER "BOOM" AN OUTSIDE SPACE REQUIRES MORE THAN ONE. IM GETTING ANOTHER.